I just love the ‘small plates’ trend. Tapas are brilliant! I’m one of those people who likes to taste everyone else’s dish at the table. I usually get Order Anxiety and pick something totally off the wall for myself, then silently sulk and wish I had just ordered whatever John did. And then I eat most of his meal. With tapas, it’s totally acceptable to order multiple items and then share them all. Those are my favorite kinds of meals. So we put one together at home! It’s hard to beat a good date night IN. Aside from having a waiter pour the wine and someone clean up the cooking and dining mess, it’s almost as fun as going out! 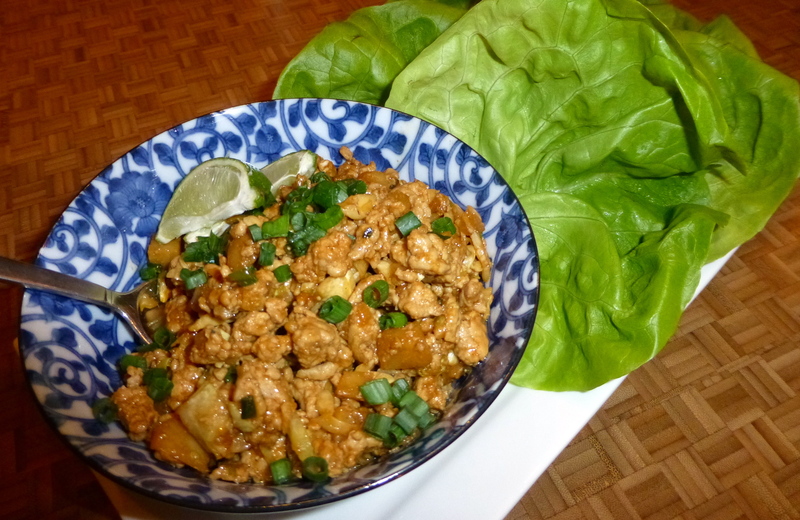 I’d been craving the Asian Pork Lettuce Wraps that I made in October, but I wanted something else to go with it. 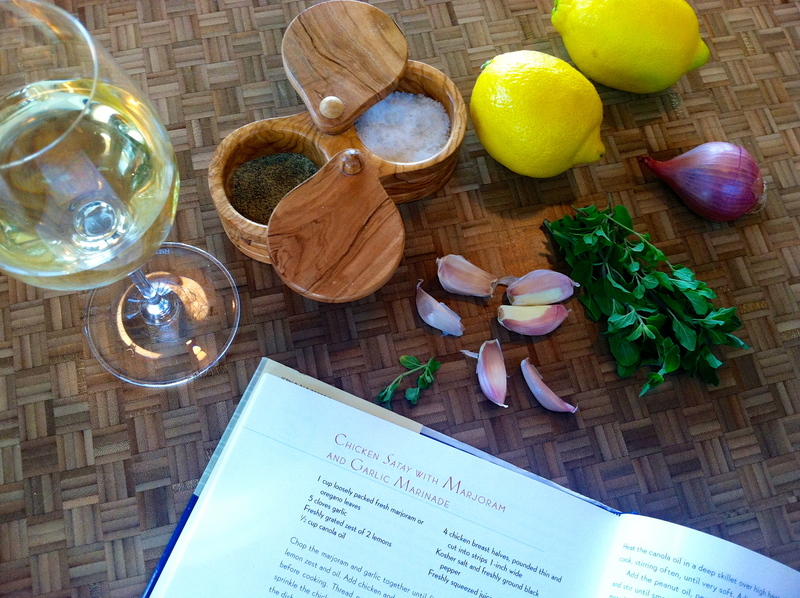 I pulled out a cookbook I’d never used for inspiration, full of Asian-inspired dishes. 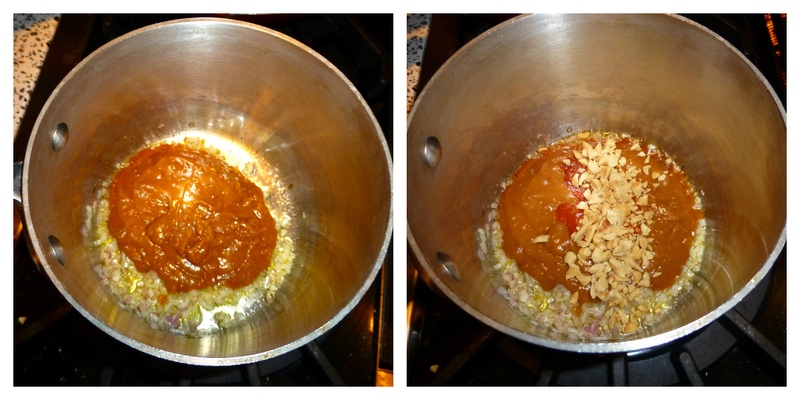 I saw a recipe for chicken satay with spicy peanut sauce. YUM. I decided to tweak it for our small plates extravaganza! 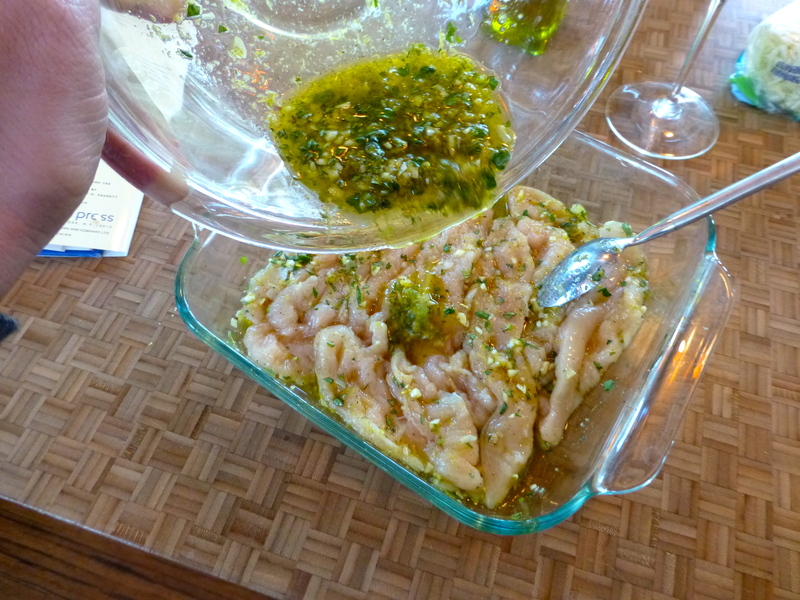 First, I wanted to get the chicken marinating in something scrumptious. I chopped up some shallot, garlic, and fresh oregano. I also zested a lemon. 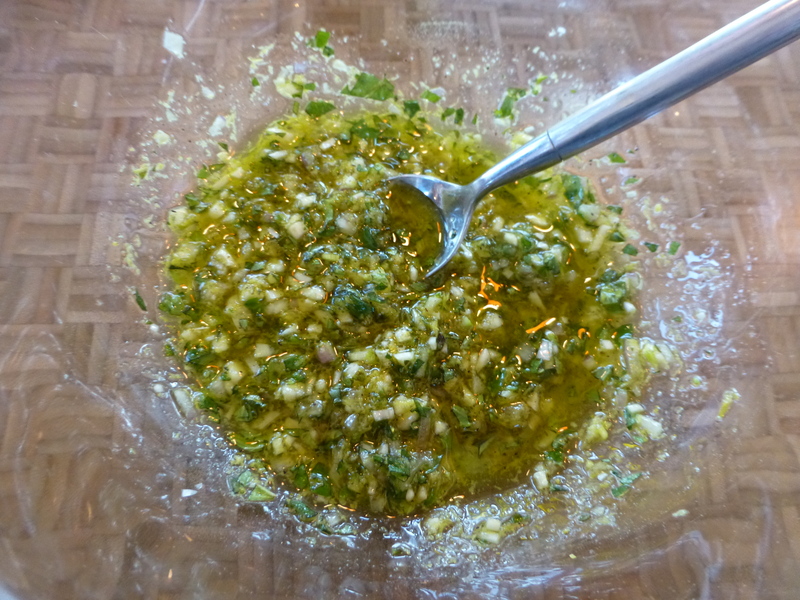 Some olive oil in a bowl, some garlic salt and pepper, and my chopped goodies- marinade DONE! 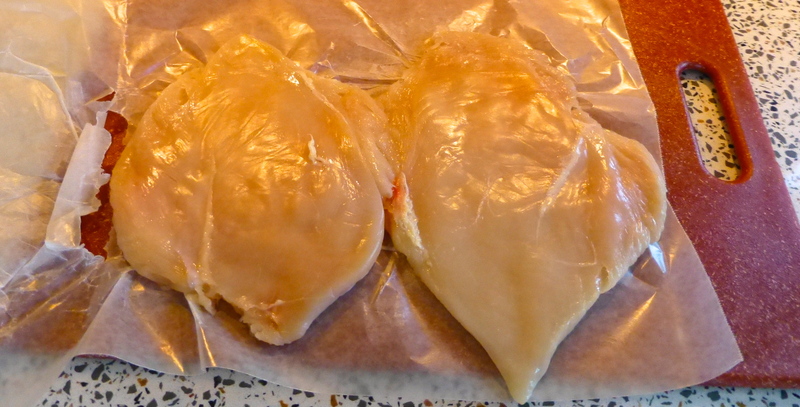 John pounded two chicken breasts flat between some wax paper for me, and I sliced them into long strips. 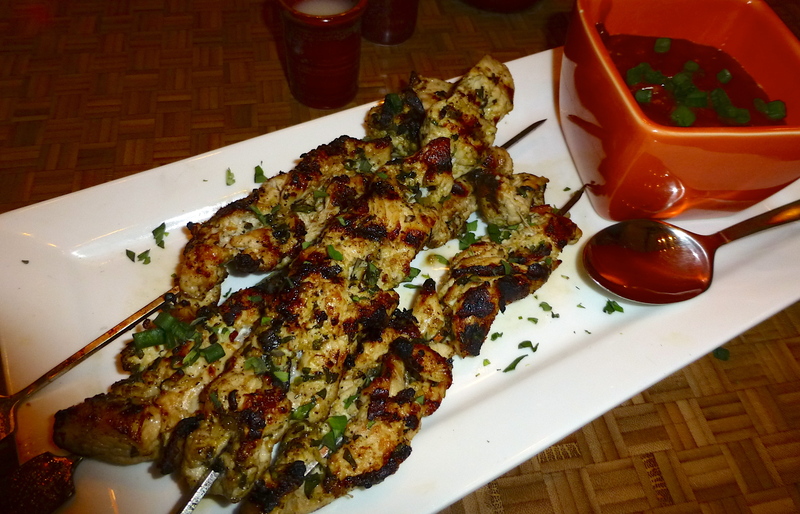 A satay means that the meat is on a skewer. Before skewering the chicken, I let it swim around in the marinade for at least 30 minutes while I prepped other things. 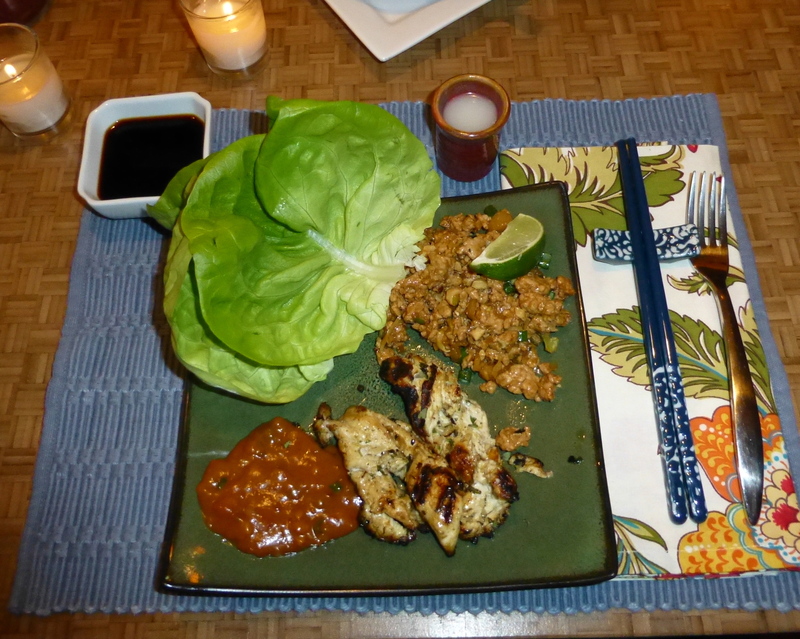 It was time to focus on the pork filling for the lettuce wraps. 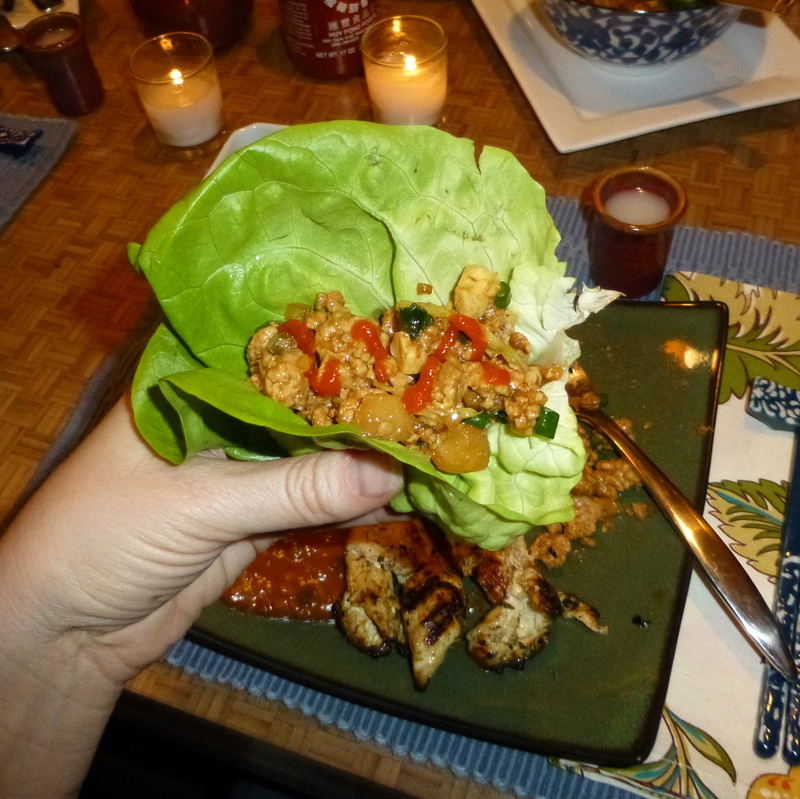 How awesome are lettuce wraps? A leafy little tortilla filled with whatever you want! A perfect vehicle with which to get something YUMMY into your mouth. So fun. I asked my local butcher to grind up some pork for me. 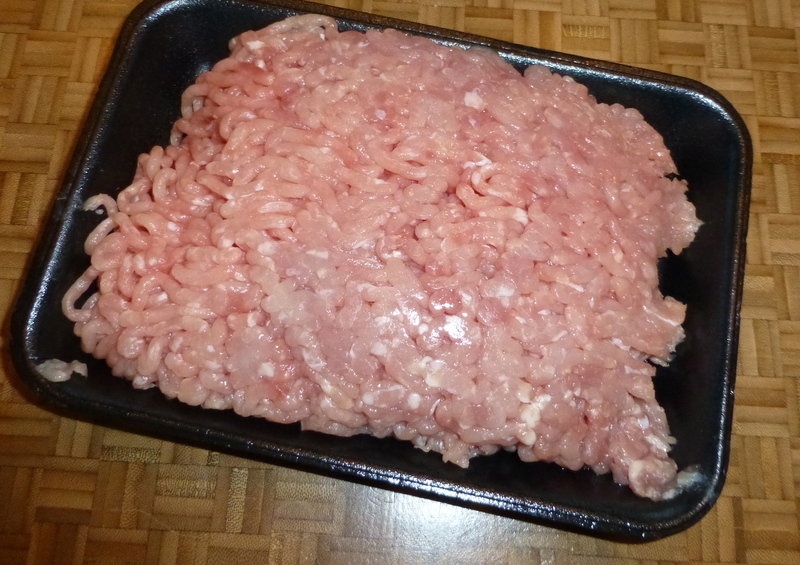 I started browning it in a pan while I chopped up some flavorings: water chestnuts, shallot, ginger, garlic. I also had scallion, shredded cabbage, and lime on hand for later. 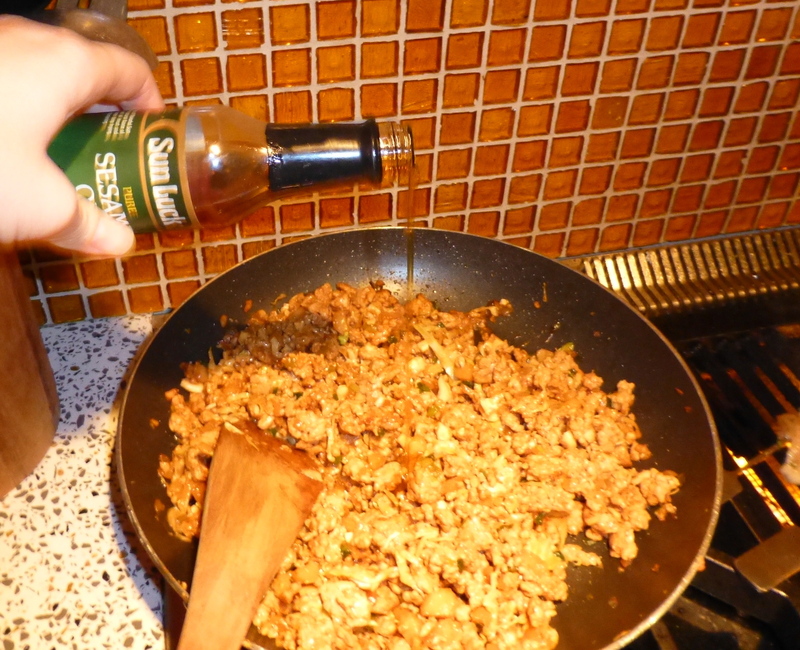 The key to the pork filling is the Asian sauces. 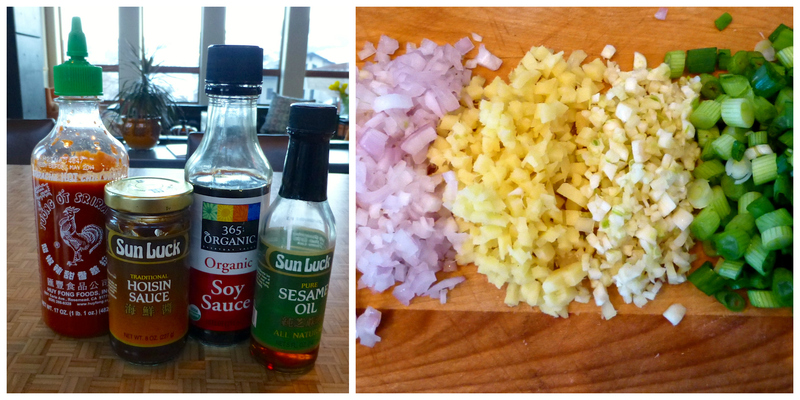 Sriracha, hoisin, soy sauce, and sesame oil make a tasty line-up! Once the pork was mostly cooked, I added the water chestnuts, then the garlic, ginger, and shallot. 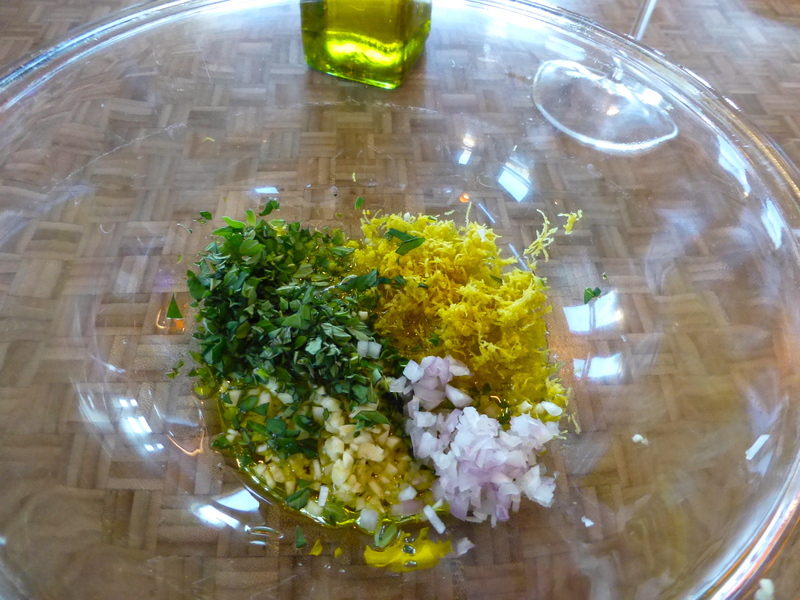 Next, I stirred in the sauces, except the sesame oil. That comes later. 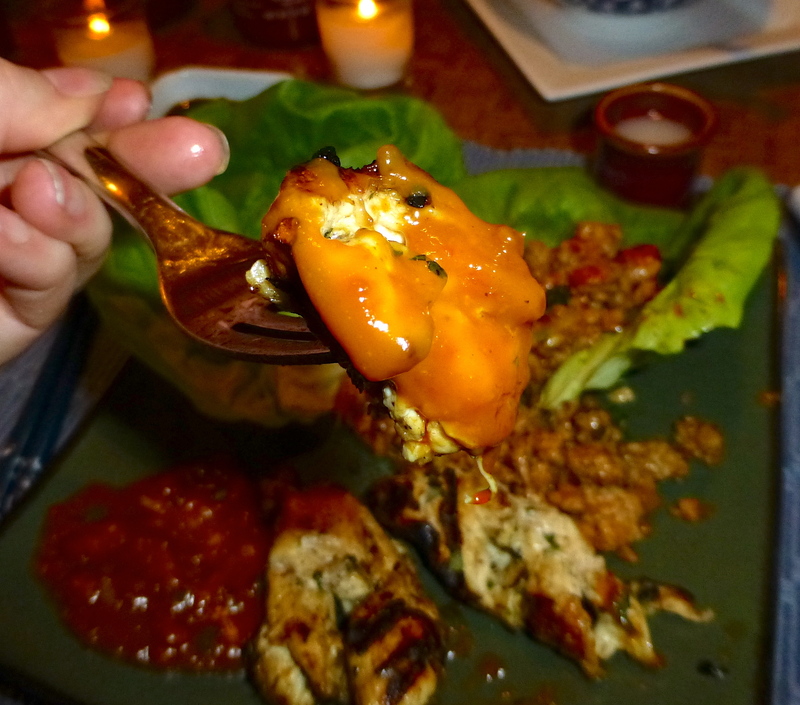 The pork filling was ALMOST ready, so I set it aside to focus on the chicken satay. 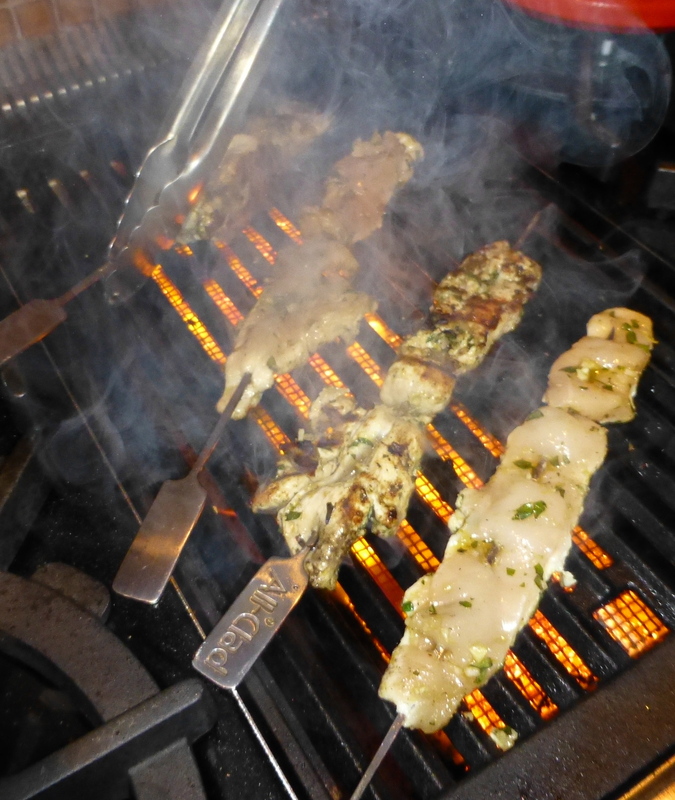 The skewers went onto a hot grill (thanks, hubby) and I started on the peanut sauce. 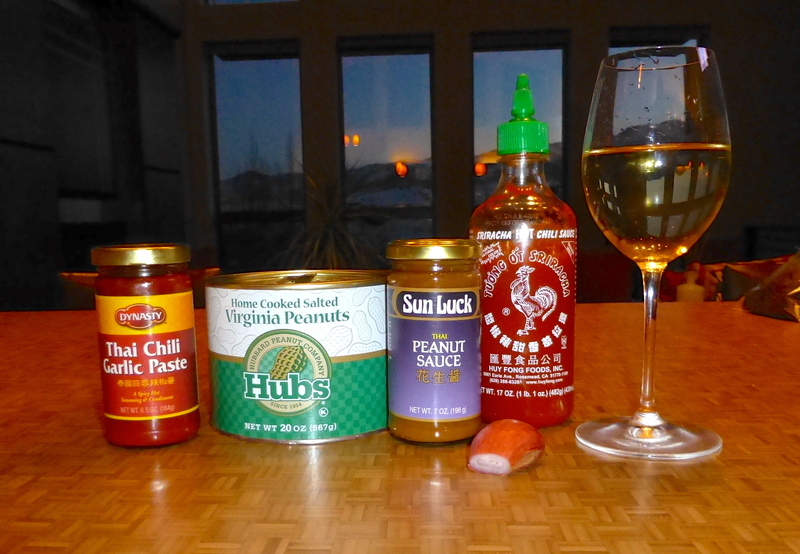 Confession: I didn’t make the peanut sauce from scratch. I meant to, but had a hard time finding a couple of the ingredients, so I figured I’d dress up one of the many prepared versions in the Asian aisle at the grocery store! 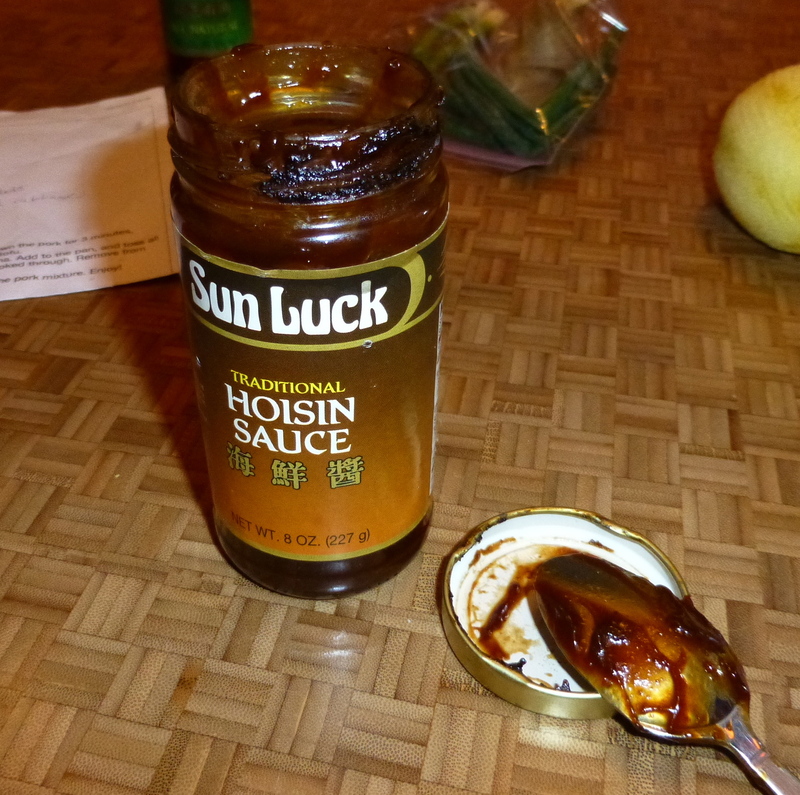 I tasted the sauce from the jar- it needed more spice and some texture. I poured the sauce into a pan and added Thai chili paste, Sriracha, a dash of white wine, some shallot, and some chopped salted peanuts. YUM. The sauce simmered away and the chicken was just about done, so I warmed up the pork filling. I stirred in the shredded cabbage and some chopped cashews. I also added a bit of sesame oil. 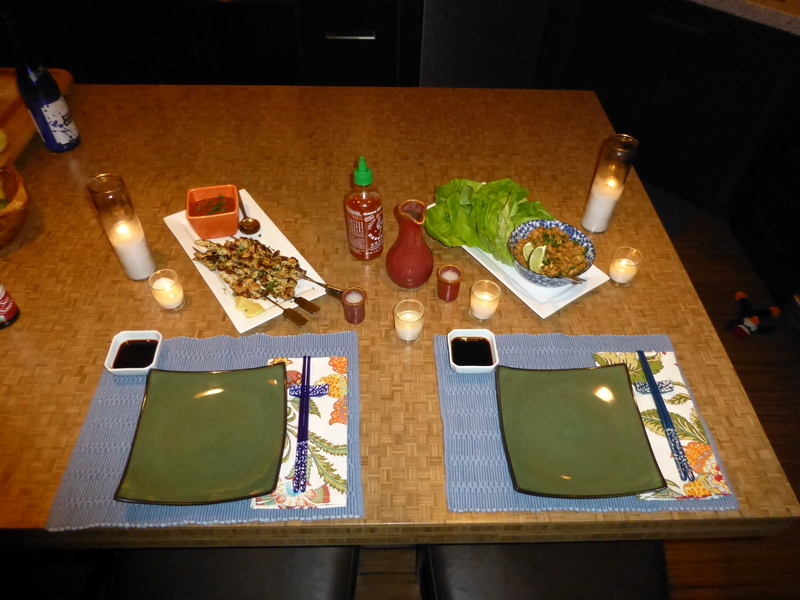 It was time to serve our Asian tapas feast! 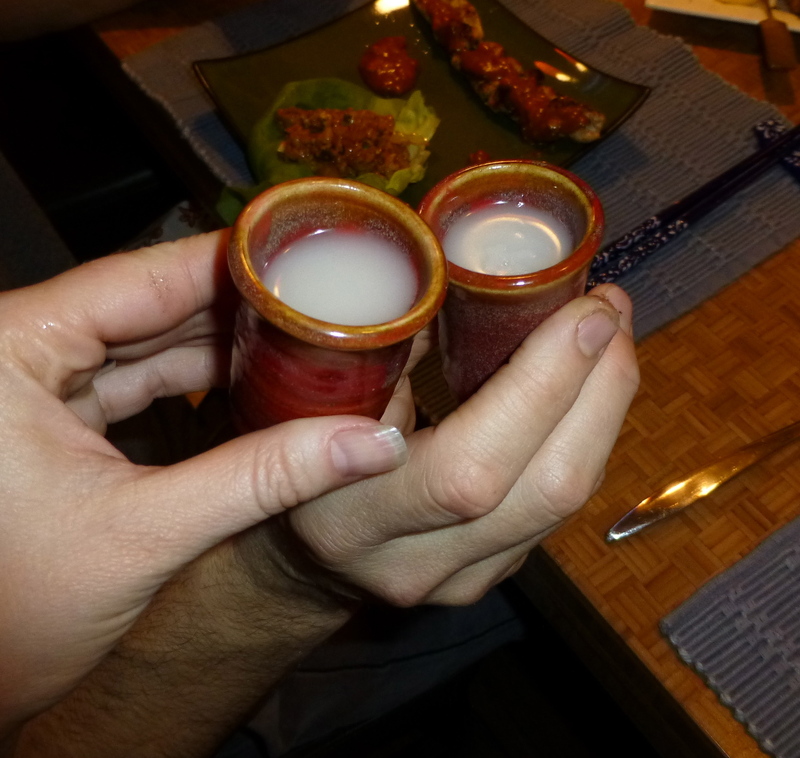 John poured some chilled sake into our cute sake carafe while I plated the food. I served the pork filling in a bowl, topped with scallions and lime for garnish, with individual butter lettuce leaves on the side for scooping. 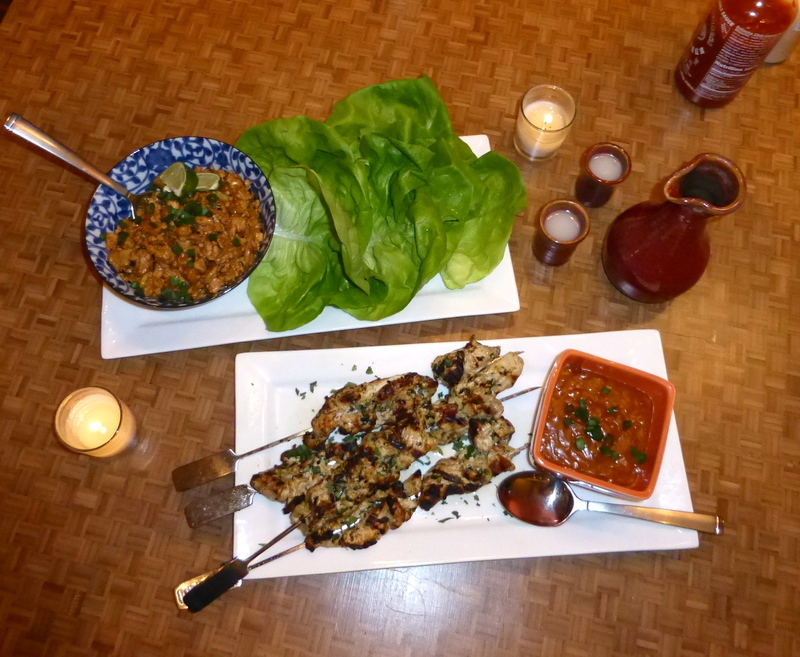 The delightfully charred chicken satays stayed on their skewers, with fresh oregano over them and a bowl of my doctored-up peanut sauce on the side. Chow down! My only complaint of the meal was that our little plates weren’t big enough for the food. Just because it was a “small plate” meal didn’t mean we didn’t eat a lot! All of the Asian spices and flavors were fabulous, and we had plenty of leftovers. 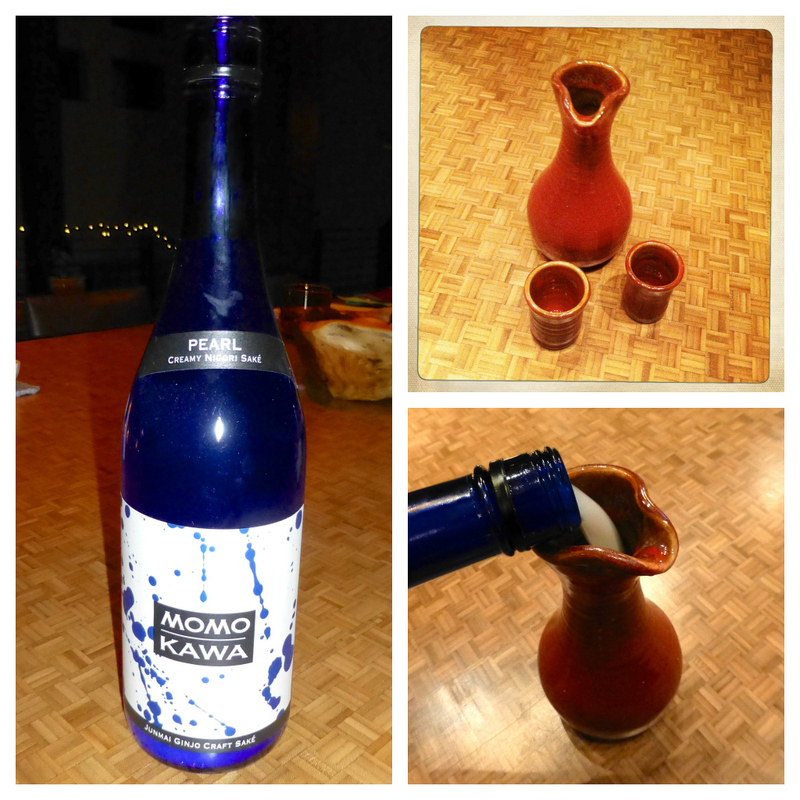 The sake made the theme extra fun. 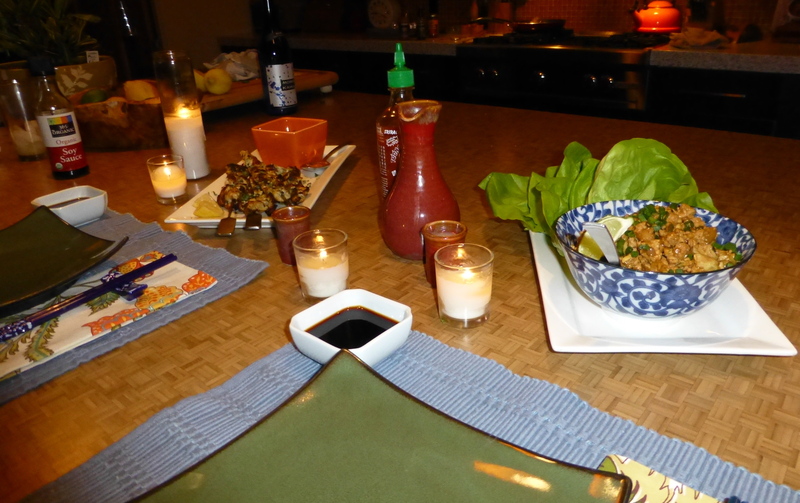 Asian Tapas Night was such a success that I’m already thinking about what theme should be next. Italian? Mexican? 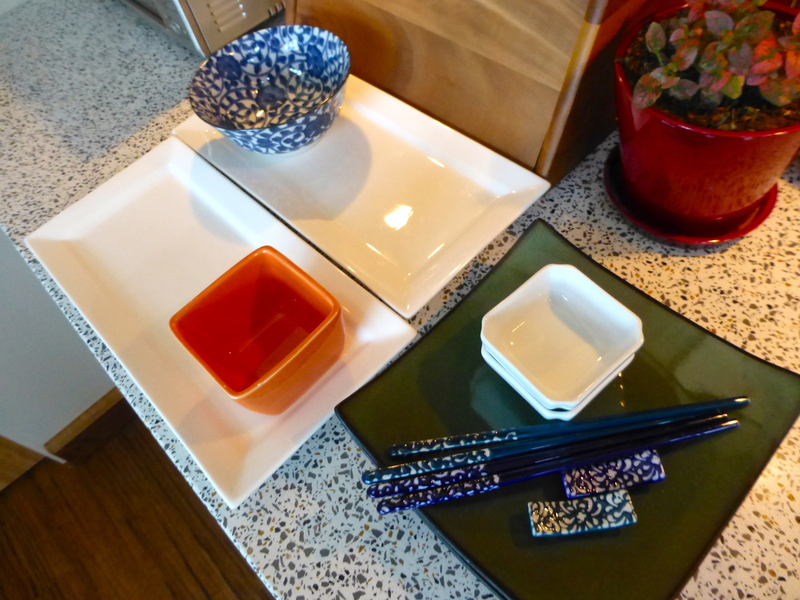 What would your ideal ‘small plates’ menu include? I know one thing: Next time, I’ll use bigger plates. Heat the oil over medium high heat in a large skillet. Brown the pork for 5 minutes, then add the water chestnuts. 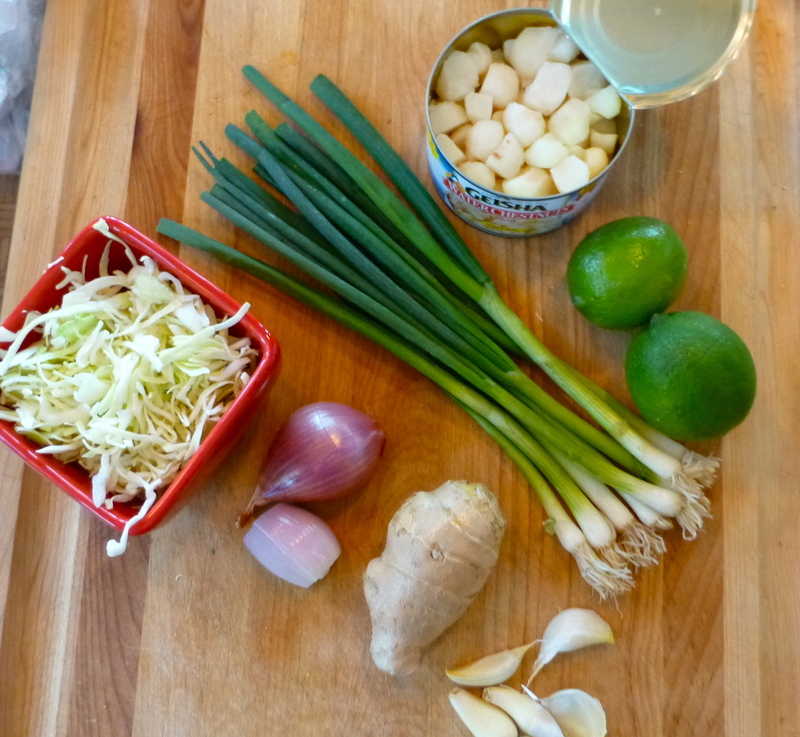 Stir in the scallions, shallots, ginger, and garlic. Cook for a few minutes. Stir in the hoisin, sambal, soy sauce, and sriracha. Cook for a few minutes. Stir in shredded cabbage and remove the pan from the heat. Stir in sesame oil and half of the cashews. 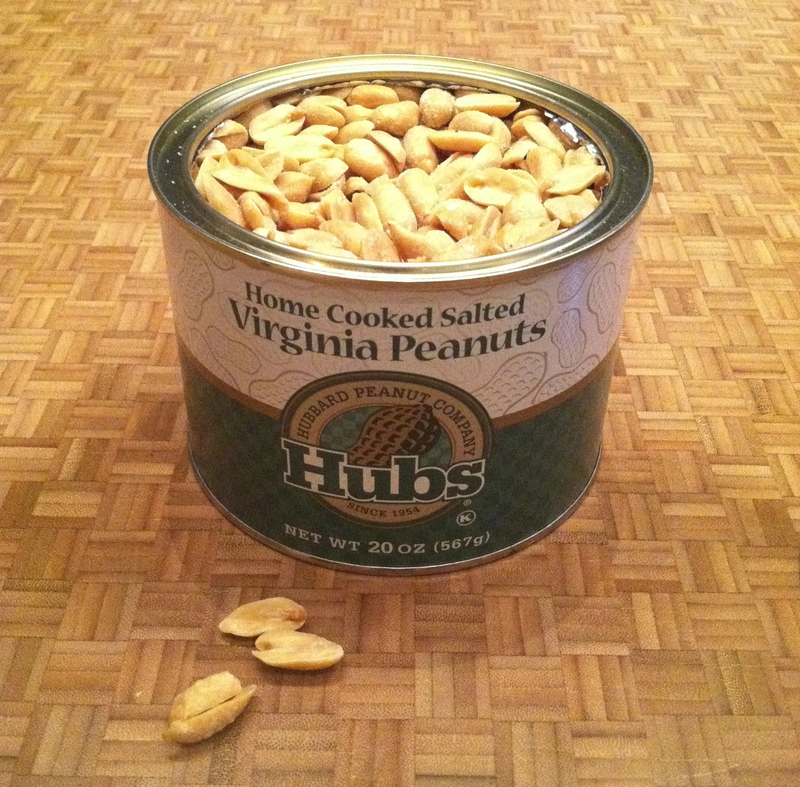 Top with a sprinkling of scallions and cashews. Serve with a big spoon for scooping and a pile of lettuce leaves. YUM! 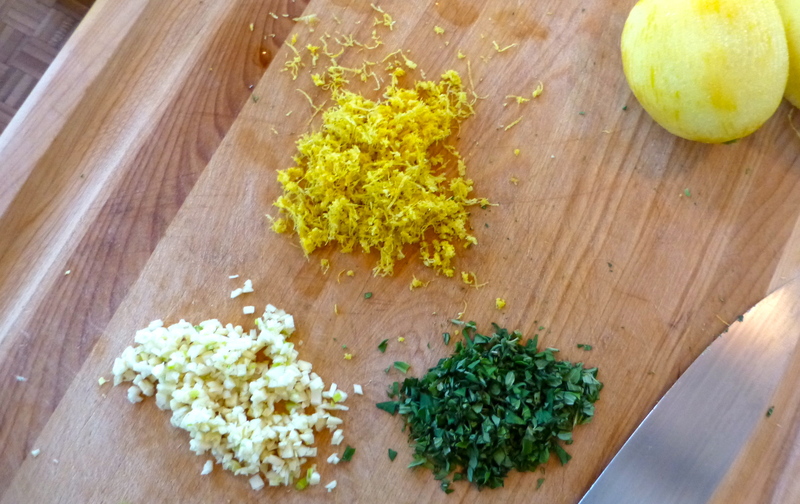 In a bowl, combine oregano, garlic, ginger, shallot, and lemon zest with the olive oil. Salt and pepper to taste. Cut the chicken into long strips. 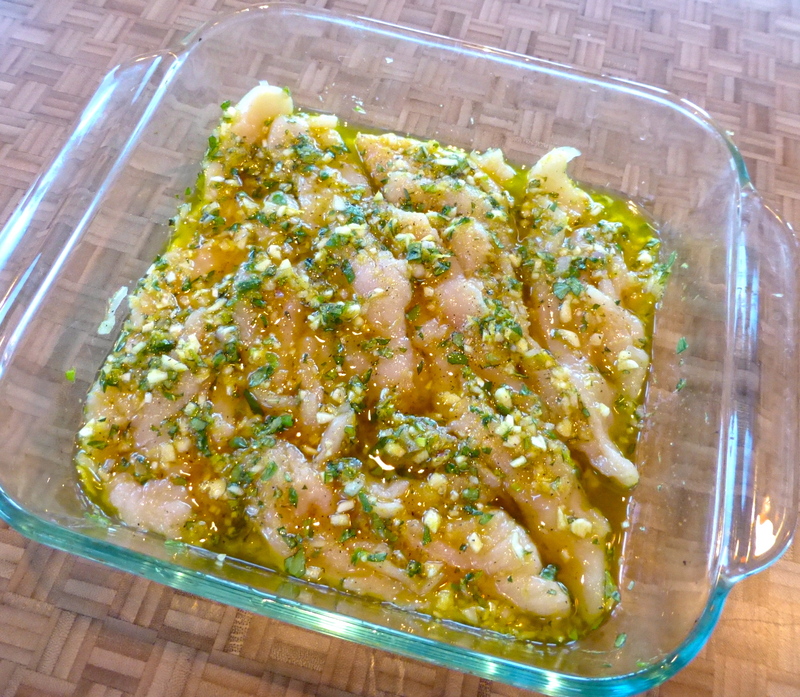 Place the chicken in the marinade, coating the chicken on all sides. Set aside for at least 30 minutes. 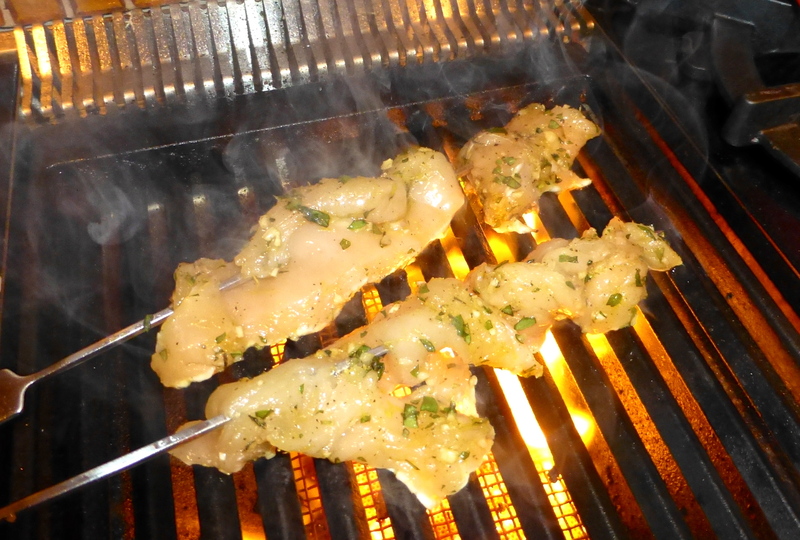 Slide the chicken strips onto metal skewers. 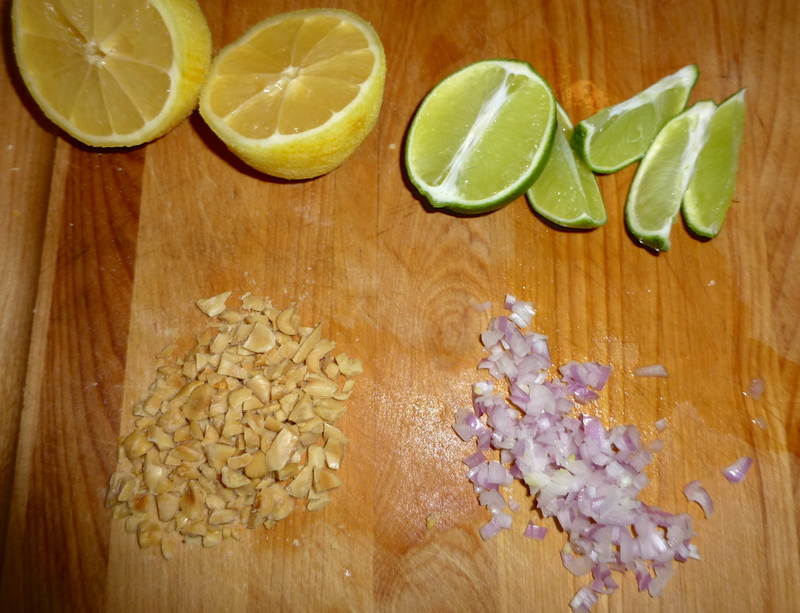 Just before grilling, squeeze a little bit of lemon juice on each satay. Serve with spicy peanut sauce and lots of sake. YUM! Both were yummy and healthy for sure! that is how we Greeks eat. We go to a taverna, chose tons of small dishes and everyone shares. It is so much cooler that way!